Can Prepping & Minimalism Co-Exist? 6 Tips to Make It So! Last year we added a third child to our 2-bedroom, 800-ish square foot house. Once she started moving around, it felt like our space shrank dramatically. Around the same time, my parents downsized, and I inherited several pieces of family heirloom furniture. 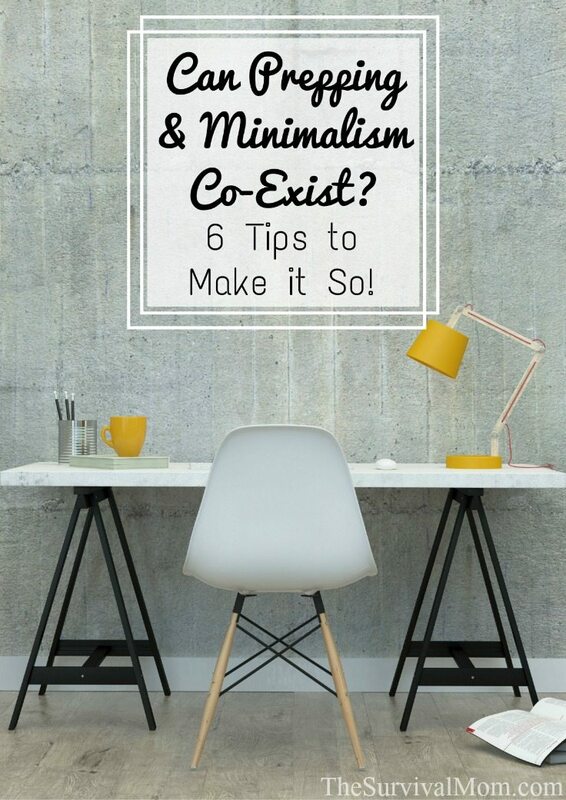 At heart, I’m a minimalist, and between these factors, my minimalist side rebelled. I wanted to get rid of everything we owned! Among other minimalist advice, I familiarized myself with Marie Kondo’s book, The Life-Changing Magic of Tidying. 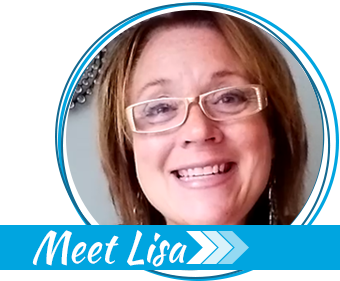 Her ideas are mainly to de-clutter or sort by category, rather than the traditional advice of doing a room or a closet. For example, do all your books at once. She’s also known for getting people to ask if any given item “sparks joy” or makes you happy, or if it detracts from your life because you’re constantly tripping over it (my paraphrase). This may all be very good advice, but along with being a minimalist, I’m also a prepepr. I’m determined to be prepared for everyday emergencies and worst case scenarios, using this handbook as a guide. With the addition of a child and furniture to my household, my prepper self was thinking about the future–both the bigger political and economic picture and our own family’s financial security. 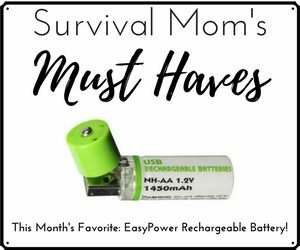 There was a good deal of “stuff” that I felt we needed to keep if we were to be prepared for any number of crises, but how could I continue with my commitment to minimalism? 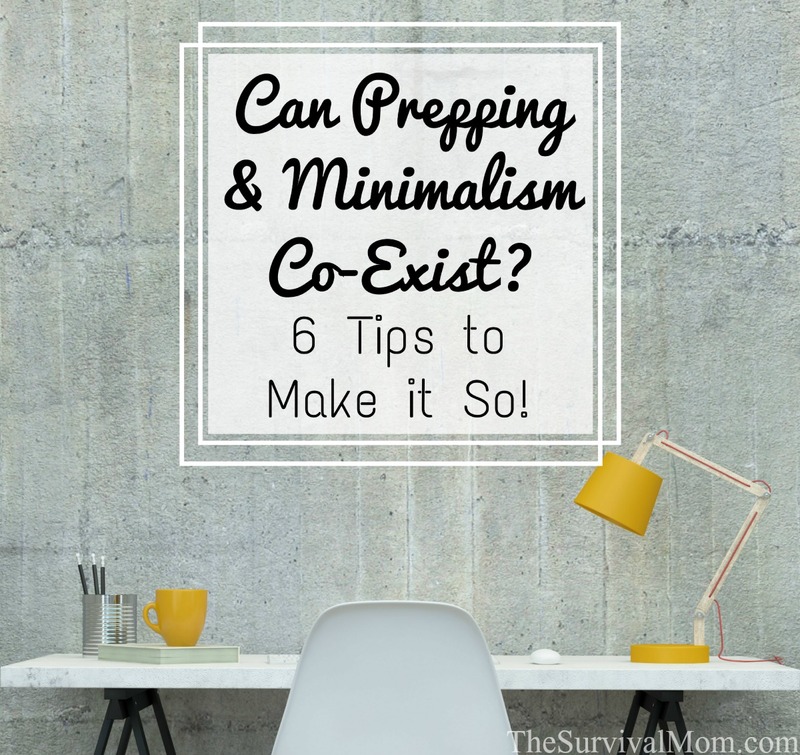 Can prepping & minimalism co-exist? There are certainly lots of articles out there about decluttering in general, and plenty about finding creative storage for your preps. But what do you decide to keep and store in the first place? 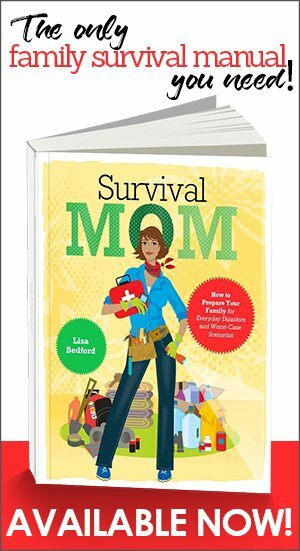 For myself, I came up with 6 criteria I used to evaluate what to keep on hand to satisfy the prepper side of me and what to eliminate to keep my minimalist side sane. From previous conversations, I knew that our main prepper categories as a family were generally: Food & Water, Education, Clothes/Warmth/Shelter, Security, Health (including mental/spiritual), and Communication. Whatever I decided to keep should generally fall into one of these categories. In the middle of the exploring toddler and the inherited furniture, we had an incident in which one of the kids got injured while I wasn’t home, and my husband couldn’t find the right box of first aid supplies. We had absolutely everything we needed for the situation, but he had to take all the kids (including the injured one) to the drugstore to buy it all again because he didn’t know where I had stored it. This was a significant learning moment for me, because being prepared and having all the right “stuff” doesn’t matter at all if you can’t find it or get to it when you need it! So one of my goals was to make everything as visible and accessible as possible. 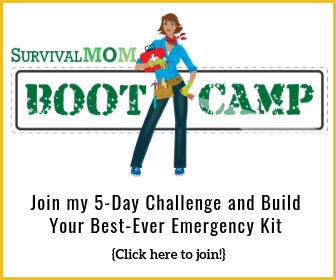 Of course you also want to be familiar with all your tools and equipment before the SHTF. One way to do this is to incorporate as much as you can into your daily life. For example, your cast iron pans can be used now on the stovetop or over a campfire in the zombie apocalypse. And once you’re using those on a regular basis, perhaps you can part with some of your other cookware, freeing up more kitchen space. Throughout this process, I was always asking: does the value of this item justify the space it requires? If not, the item went in the give-away box. One of the tactics I used was to incorporate practical items into my decorating. For example, I mixed lanterns with my prized antique books on the shelves. They fit together perfectly! When evaluating my space, I had to embrace the hard truth that I just wouldn’t be able to keep everything I wanted. Once I accepted that, though, it was easier to make decisions based on my other criteria. For example, it was important to keep books that are reference material, or educational, and less important to keep contemporary fiction. Of course, entertainment and distraction is important in times of stress, so I kept plenty of fiction, too, but evaluated it in terms of quality and our family’s interests. So while I evaluated each reference book (and got rid of a few! ), I prioritized those over fiction where space was limited. None of your storage does any good if it’s hidden away and you forget about it. For me, keeping lists was too much hassle for our current schedules, so really limiting unseen storage was my priority. Now I can tell you exactly what I have stored in the far corners of my basement today, and I can count it on one hand! We have a few tubs of sentimental items and photo albums. There’s a set of collector drinking glasses from my grandma that I cannot safely display in our current space, but definitely want to keep. Our file boxes are clearly labeled by year and can be sorted/shredded as they hit their “keep until” dates. There are 5 pieces of the furniture that I could not incorporate into this space, but are certainly worth keeping in hopes of a larger home someday. And our Christmas decorations (which are definitely minimalist!). It’s been easier to identify needs and priorities. We all have limited resources, and sometimes it’s hard to know what to get next. Once you know what you do have, you can easily see what you don’t have and prioritize these needs. For me, one of the items that wasn’t on any wish list, but that jumped out at me as a need was a small household tool kit, which I now have. My choices are now more obvious. Once you identify your needs, you still have to make a choice about how to fill it. For example, a wheat grinder was on my list. Typing “wheat grinder” into Amazon gave me almost 500 results! But now that I had decluttered the kitchen and kept my Kitchen Aid mixer, my choices for our space and needs seemed obvious: a Kitchen Aid attachment or the Vittorio Deluxe Manual grinder. Then it was just a matter of evaluating only 2 choices and making a decision. I have room for new items. Since I earned my Ham radio license earlier this year, my radio equipment has been cluttering the top of my desk, which was messy to look at and probably not the safest for the radio. After I decluttered, though, I suddenly found I had an entire drawer free just for ham radio equipment. I have more time and less stress. As someone who reads between the lines of the evening news, there’s enough to worry about already. Reducing our clothes and kitchen items has made a dramatic improvement in maintaining the household. Our laundry and dishes are noticeably less! And now I can spend my newly found free time on developing skills and relationships. How do you make the most of your space and still stay organized? I moved my mom + her stuff into my home + we gave up our bedroom + bath as it was so close for her overactive bladder. I too finally had to go buy bandaids because I couldn’t find anything. Not knowing where things were put is stressful. I can’t imagine what it would be like in a major crisis. Getting rid of things I was keeping “just in case” is also stressful, but my sanity is relying on some relief. Even when things were in a pile I knew which pile + how far down but I have to have some kind of reference + control. A year after the move the medical stuff was found behind some of her furniture in the shop. NOT a prepared way to live! Thanks for the nudge. I will begin the task. I’ve been really working on cleaning out and purging a ton of stuff over the last couple of years. I totally agree that when you know what you have, you’ll know better what you need. Absolutely. And now decorative items have almost become a pet peeve of mine. So many of them are just unnecessary items that you have to dust. 😉 So I just love your idea of incorporating useful items into your decorating! I think you’ve been”hacked”. When I click on your blue link for the free iBook to Declutter.. it takes me to,AMAZON to buy a Japanese Art of Decluttering book to buy. Hmm. Sometimes links get funky, so I’ll check that one out and make a correction. Thanks! Having to make room for new people definitely makes prepping more difficult. I actually have no more space at this point in time. It means passing up chances at new supplies, even if they’re free. Love the cover of your eBook! LOL that’s how I’m feeling now. Thank you!